So, do we want to implement a download counter for each of the add-ons on the new add-on page? The DokuWiki pluginrepo that was adapted for Nightingale has a sortable popularity column (see here). From what I understand, for DokuWiki, this column has a bar representing the total number of installs for each plugin divided by the total number of installs of all plugins. I believe DokuWiki collects their install numbers using a popularity feedback plugin that is bundled with DokuWiki. For us, I'm wondering if we can replace this with another DokuWiki plugin, DLCount, that counts the number of downloads and adds a download counter next to download links. The popularity column of our forked pluginrepo would then have to be modified to collect download counts from each of the meta-files that the DLCount plugin creates. Thoughts? Does this make sense? (06-15-2015, 04:08 AM)zjays Wrote: For us, I'm wondering if we can replace this with another DokuWiki plugin, DLCount, that counts the number of downloads and adds a download counter next to download links. (06-15-2015, 04:08 AM)zjays Wrote: The popularity column of our forked pluginrepo would then have to be modified to collect download counts from each of the meta-files that the DLCount plugin creates. Remove popularity column from table - I quickly found out that the DLCount Dokuwiki plugin doesn't work for the download button of the pluginrepo Dokuwiki plugin, and I don't want to work on this any more for now. As a sort-of substitute, we can use the Rating Dokuwiki Plugin on each plugin entry page and display the average rating statistics of all add-ons in a chart somewhere else on the wiki (see previews below). My goal with this is to see which add-ons people are using the most and which ones have major problems. Install the updated pluginrepo (the ngale branch) to the Wiki (Needs Nightingale Admin). Let me know your thoughts on the above. I don't think I want to make any more big changes in the near future. So if everyone is okay with what GeekShadow and I have done, I think it's ready to deploy to addons.getnightingale.com after finishing the last to-do items! (07-17-2015, 12:00 PM)zjays Wrote: So if everyone is okay with what GeekShadow and I have done, I think it's ready to deploy to addons.getnightingale.com after finishing the last to-do items! I don't see any issues with your list, however I did not have a look at the dropbox thing (downloading seems not to work without JS anymore). I'd rather not have a second DokuWiki instance, or is the new add-on platform independent of DokuWiki itself? If not, I'd just keep it in the wiki (similar to the current add-on page) and redirect addons.getnightingale.com towards that, instead of directly deploying there. In that case, imho you can directly deploy to the current playground, and if it works and we have all content migrated we (read: GeekShadow, as he is the only wiki admin iirc) can rename the playground and link to it from addons.getnightingale.com. (07-18-2015, 04:05 AM)rsjtdrjgfuzkfg Wrote: I don't see any issues with your list, however I did not have a look at the dropbox thing (downloading seems not to work without JS anymore). 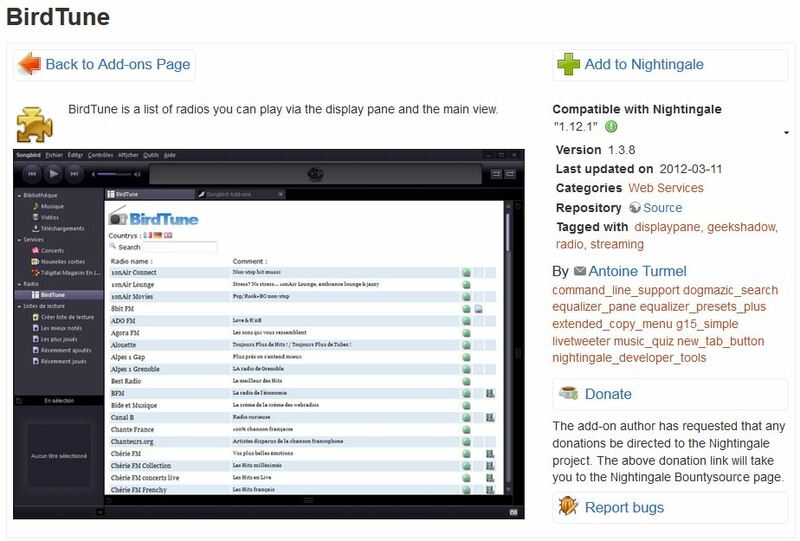 The main add-on repository page is basically what Geekshadow already has on the current Nightingale Wiki (http://wiki.getnightingale.com/doku.php?...playground), except with the popularity column removed and the add-on categories updated. (07-18-2015, 04:05 AM)rsjtdrjgfuzkfg Wrote: I'd rather not have a second DokuWiki instance, or is the new add-on platform independent of DokuWiki itself? Sorry, I should have explained it better. It won't be a second DokuWiki instance - it's using a Dokuwiki plugin that Geekshadow already installed to the Nightingale Wiki a few years ago (he explains it earlier in this thread). We had to modify the plugin because it was originally intended just for Dokuwiki's own usage (to handle their own collection of plugins). I was just using a Dokuwiki instance installed locally on my computer to test out my changes. So if my modifications to the plugin are approved, the updated plugin will just have to be re-installed to the current Nightingale Wiki. (07-18-2015, 04:05 AM)rsjtdrjgfuzkfg Wrote: If not, I'd just keep it in the wiki (similar to the current add-on page) and redirect addons.getnightingale.com towards that, instead of directly deploying there. In that case, imho you can directly deploy to the current playground, and if it works and we have all content migrated we (read: GeekShadow, as he is the only wiki admin iirc) can rename the playground and link to it from addons.getnightingale.com. Actually, the way the plugin is coded right now, it needs to live on the "add-ons:" namespace. So I'm thinking when it's ready, we move the old add-ons page to something like "add-ons_old:", and move the playground to "add-ons:" (and then addons.getnightingale.com would already re-direct to it). (07-18-2015, 05:24 AM)zjays Wrote: So I'm thinking when it's ready, we move the old add-ons page to something like "add-ons_old:", and move the playground to "add-ons:" (and then addons.getnightingale.com would already re-direct to it). The new add-on repository includes the option for a Donate button. I'll put the Nightingale Bountysource link (https://www.bountysource.com/teams/nightingale) as the Donation button for any add-ons developed by Nightingale devs (Geekshadow, freaktechnik, rsjtdrjgfuzkfg) and the core ones previously developed by POTI and now maintained by Nightingale devs. If anyone has any issues with this, or if you prefer a personal donation link, let me know. (07-22-2015, 05:38 AM)zjays Wrote: If anyone has any issues with this, or if you prefer a personal donation link, let me know. For now that seems reasonable, although we should figure something better out for project donations if we see that people are actually interested in donating, as their fees are quite high (but proper donation handling is terrible due to legal stuffz, imho). I'm unsure if/how we should mark the donation link clearly as belonging to the project and not the individual add-on, though. (07-24-2015, 09:26 AM)rsjtdrjgfuzkfg Wrote: I'm unsure if/how we should mark the donation link clearly as belonging to the project and not the individual add-on, though. I think that's a good point. How about this for now?